But with powerful computer models that can simulate how plants move water, carbon dioxide and other chemicals between ground and air, Swann has found that vegetation can control weather patterns across huge distances. The destruction or expansion of forests on one continent might boost rainfall or cause a drought halfway around the world. The world’s major forests … can move water on almost inconceivably large scales. Scientists reacted strongly. Early meteorologists, hoping to save their young field’s credibility, rejected the notion that forests influence weather. “Much of the discussion of it, unfortunately, has not been of a purely scientific character,” one wrote in 1888 in Science. Meteorology, and later climate science, became the study of air and water. Plants were relegated to passive participant status. Atmospheric scientists — and everyone else — could be excused for thinking of a stoically standing tree or a gently undulating wheat field as doing little more than passively accepting sunlight, wind and rain. But plants are actually powerful change agents on the planet’s surface. They pump water from the ground through their tissues to the air, and they move carbon in the opposite direction, from air to tissue to ground. All the while, leaves split water, harvest and manipulate solar energy, and stitch together hydrogen, oxygen and carbon to produce sugars and starches — the sources of virtually all food for Earth’s life. The key features of this molecular wizardry are pores, called stomata, in plant leaves. A single leaf can contain more than 1 million of these specialized structures. 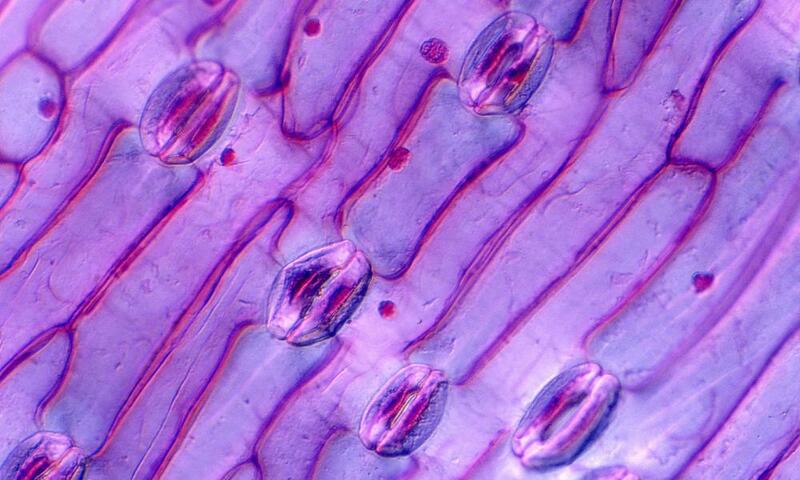 Stomata are essentially microscopic mouths that simultaneously take in carbon dioxide from the air and let out water. As Swann notes, the gas exchange from each stoma — and indeed from each leaf — is, on its own, tiny. But with billions of stomata acting in concert, a single tree can evaporate hundreds of liters of water per day — enough to fill several bathtubs. The world’s major forests, which contain hundreds of billions of trees, can move water on almost inconceivably large scales. Antonio Nobre, a climate scientist at Brazil’s National Institute for Space Research, has estimated, for example, that the Amazon rainforest discharges around 20 trillion liters of water per day — roughly 17 percent more than even the mighty Amazon River. This micrograph of a stained leaf shows the mouth-shaped stomata, or regulated pores, that plants open and close to control the amount of water vapor they release into the air. A single tree can release the equivalent of hundreds of liters of water in a day. Scientists have known since the late 1970s that the Amazon rainforest — the world’s largest, at 5.5 million square kilometers — makes its own storms. More recent research reveals that half or more of the rainfall over continental interiors comes from plants cycling water from soil into the atmosphere, where powerful wind currents can transport it to distant places. Agricultural regions as diverse as the U.S. Midwest, the Nile Valley and India, as well as major cities such as Sao Paulo, get much of their rain from these forest-driven “flying rivers.” It’s not an exaggeration to say that a large fraction of humanity’s diet is owing, at least in part, to forest-driven rainfall. Such results also imply a profound reversal of what we would usually consider cause and effect. Normally we might assume that “the forests are there because it’s wet, rather than that it’s wet because there are forests,” said Douglas Sheil, an environmental scientist at the Norwegian University of Life Sciences campus outside Oslo. But maybe that’s all backward. “Could [wet climates] be caused by the forests?” he asked. Swann arrived at the University of California, Berkeley, in 2005 to do her doctoral work with Inez Fung, an atmospheric scientist. In the 1980s, Fung had helped pave the way for climate models that included realistic vegetation and associated carbon dioxide fluxes. (Among her other accomplishments, she was a co-author on the 1988 paper with the NASA scientist James Hansen that helped bring climate change to the public’s attention.) The model she worked with was state-of-the-art at the time, but, like its counterparts at other research institutions, it could only represent the biosphere simplistically. By the mid-2000s, models had improved enough that scientists could more precisely study the role plants might play in the climate system. Fung suggested that Swann try foresting the Arctic in a climate model. Trees are colonizing higher latitudes as the globe warms, so it seemed reasonable to ask what impact they would have on the region’s climate. Other researchers had previously looked into the potential effects of an expansion of northern spruce forests; unsurprisingly, they found that the Arctic would likely get warmer because those trees’ leaves are dark and would absorb more sunlight than virtually any of the tundra, ice and shrubs they might replace. Swann decided to look into what would happen if the encroaching forests were deciduous trees with lighter colored leaves, such as birch or aspen. In her model, the Arctic did still warm — by about 1 degree Celsius, which was more than she expected. Swann determined that her simulated forests emitted a lot of water vapor, which, like carbon dioxide, is a greenhouse gas that absorbs infrared radiation from Earth and redirects some of it downward. The vapor then caused ice to melt on land and at sea, exposing darker surfaces that absorbed yet more sunlight and grew even warmer. The new forests had set off a feedback loop, amplifying the impact of climate change. The finding hinted at the power that plants could exert over a region’s climate. 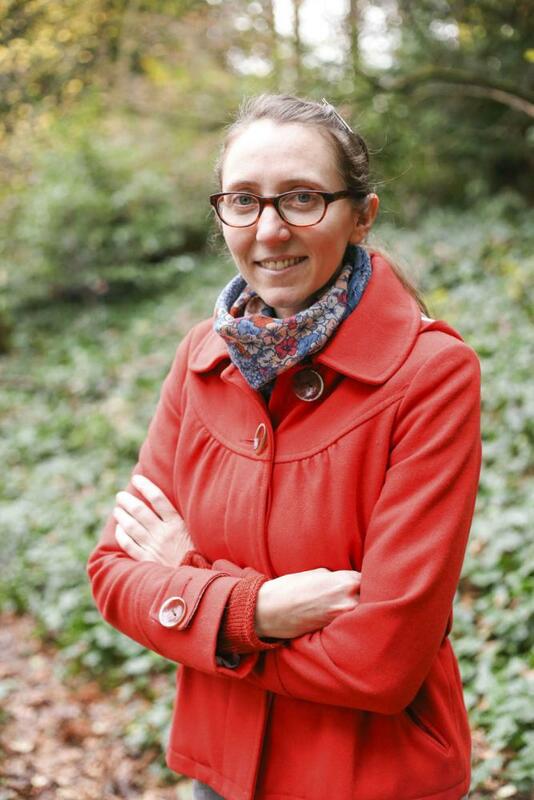 Abigail Swann, who heads the Ecoclimate lab at the University of Washington, is at the vanguard of scientists studying how plants can exert an unexpectedly great influence on weather patterns. In a separate study, Swann turned all vegetated areas of temperate North America, Europe and Asia into forest. Again, this exercise exaggerated something already happening in the real world: Satellite data have shown that these continents are greening as former farmland returns to forest, perhaps aided by enhanced atmospheric carbon dioxide and longer growing seasons. As in the Arctic study, the new trees absorbed sunlight and warmed, adding energy to the climate system. Atmospheric currents then redistributed this energy around the planet. Droughts descended on the southern Amazon and rain fell in the Sahara. These effects were caused by a repositioning of the Hadley cell — the massive conveyor belt of air that rises from the equator, dumps its rain over the tropics, and descends again as dry air at around 30 degrees north and south latitudes, where most of the world’s deserts are. Through the influence of plants alone, the Hadley cell had shifted to the north. Swann had seemingly uncovered a hidden “teleconnection” — a region holding sway over a far distant one through subtle atmospheric mechanisms. Fung wasn’t that surprised: Atmospheric scientists have gotten comfortable with such remote influences. In periodic El Niño events, which have been understood since the 1920s, unusually warm surface water in the eastern Pacific Ocean triggers heavy rain in western South America and Africa and droughts in Southeast Asia and Australia. The novelty in Swann’s simulated events was that forests, not oceans, did the influencing. Scenarios such as a green Arctic or a reforested temperate zone are not as far-fetched as they may seem. A recent study in Nature reported that in the last three and a half decades, tree cover has increased by more than 2 million square kilometers in these regions. When she wiped out trees in the Pacific Southwest, forests in the Midwest and eastern U.S. suffered. Much effort has gone into understanding how future climate change will affect forests. Based on severe droughts that occurred in 2005, 2010 and 2015, some scientists believe the Amazon may be nearing a tipping point that would cause much of its rainforest to turn to savanna, with potentially devastating consequences for carbon storage, biodiversity and local climate. A paper from late 2017 provided evidence that future warming would make droughts even more lethal to the forests of the American Southwest. Some scientists predict that many of the Southwest’s forests could become savanna or grasslands, and at least one — Nate McDowell at Los Alamos National Laboratory — has been quoted as saying that a large fraction of the region’s trees could die. Pritchard said he hadn’t previously been aware of the stomatal closure effect. The knowledge inspired him to join a group led by Gabriel Kooperman, a climate scientist then at UC Irvine, investigating the future effects of enhanced carbon dioxide over the three major tropical forest regions — the Amazon, Central Africa and Southeast Asia. What we would like to be able to say is, if you plant this amount of trees, you would see this reduction in planetary warming. In a study published in Nature Climate Change in April, the researchers found that the closing of stomata would cause half the rainfall changes the regions would see by 2100. Moreover, the Amazon — home to the world’s most carbon-rich and biodiverse rainforest — would get hit with the most severe declines. And in a study published in May, she investigated how U.S. forest die-offs would affect forests elsewhere in the country. In her models, she killed off forests in 13 heavily forested regions that the National Science Foundation has identified as being ecologically distinct. The results were dramatic. When she wiped out trees in the Pacific Southwest, forests in the Midwest and eastern U.S. suffered. In recent years, the Pacific Southwest has, in fact, lost an estimated 100 million trees, mostly to droughts and voracious insects. The effects of forest die-off can also be positive, however. In Swann’s study, removing trees from the mid-Atlantic actually helped forests elsewhere, by making those regions’ summers cooler or wetter. Swann emphasizes that this does not mean people should cut down forests, which provide innumerable benefits beyond their influence on other regions, including carbon storage, wildlife habitat and water filtration. But she notes that environmental groups often plant trees as a climate solution without considering whether the trees could harm forests elsewhere — or warm the planet by absorbing solar energy. Many of us are surprised at what a powerful role plants actually play. Addressing these concerns won’t happen overnight, however. Most models, unlike the CESM, can only be run at a modeling center by the handful of scientists who created them. Those people are busy running simulations for the next Intergovernmental Panel on Climate Change report, due out in 2022. None of the models being used fully account for plants’ influence on climate, Swann said. But how much rain will fall in a given region, and when, and how much it will vary season to season and year to year, will make all the difference in determining which places will remain livable and which places won’t. And Swann and Fung’s results open up at least the possibility that plants could have as much effect as cloud physics on nailing down the answers to such questions. That’s why Swann is starting a new project: to try to quantify how much plants contribute to the uncertainty in climate model results. With that number in hand, she may have an even more potent tool for convincing other researchers that ecology and atmospheric science are inseparable. Gabriel Popkin is a freelance science and environmental writer based in Mount Rainier, Md., just outside the nation’s capital. He has written forScience, Nature, The New York Times,Johns Hopkins Magazine, APS Newsand many others.